For use where a single hook or a series of single hooks is desired. Add a decorative accent to any room. Includes fasteners for quick and easy installation. For use in bedrooms, bathrooms, closets and foyers. 2-7/8" upper hook projection. Includes fasteners for installation. For use in bedrooms, bathrooms, closets and foyers. 2-7/8" upper hook projection. Includes fasteners for installation. For use in bedrooms, bathrooms, closets and foyers. 2-7/8" upper hook projection. Includes fasteners for installation. Ideal for use in bedrooms, bathrooms, closets, and foyers. With screws - polybagged. For use in bedrooms, bathrooms, closets and foyers. 2-7/8" upper hook projection. Includes fasteners for quick and easy installation. For use where a single hook or a series of single hooks is desired. Add a decorative accent to any room. Includes fasteners for quick and easy installation. 1-3/4"H x 2-3/4"W. Hole diameter 5/32". Screws included. 1-3/4"H x 2-3/4"W. Hole diameter 5/32". Screws included. Screws included. Projection 2-5/16" lower hook, 2-15/16" upper hook, base 1-9/64"H x 1-23/32"W. Polybagged. Designed to hold coats, hats and other clothing. Vinyl coated. Safe working load 15 lbs. For use in the closet, kitchen, bedroom or bathroom. Contemporary design blends with many decorating schemes. Includes fasteners for quick and easy installation. Screws included. Projection 2-5/16" lower hook, 2-15/16" upper hook, base 1-9/64"H x 1-23/32"W. Polybagged. 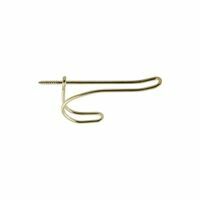 National Hardware Coat/Hat Hook, Series: V161, 35 lb, Steel, Brass, For Use in Bedrooms, Bathrooms and Closets Screws included. Projection 2-5/16" lower hook, 2-15/16" upper hook, base 1-9/64"H x 1-23/32"W. Polybagged.